The cows on Midsummer Common in Cambridge are now on Twitter: Daisy Bullocks. The delightful banter and corny jokes there brought back my earliest internet humour memory, from cam.misc. The 1995 thread was called “Council mission to terminate all cyclists (and pedestrians)”. After a fair amount of googling, I can’t find it archived online, so I scanned it in. Carrie Anne Philbin ran a music-making workshop for 32 school kids, using the Sonic Pi programming environment on Raspberry Pi computers. I was one of about half a dozen volunteer helpers. When I originally signed up, I really wasn’t sure how much I’d be able to help, but after an hour or two this morning of reading through the Sonic Pi chapter of Carrie Anne’s great book, Adventures In Raspberry Pi, then writing my own crib sheet and trying out some sample code, I felt quite confident. As parents and kids started arriving, my focus moved to looking out for kids who didn’t have anyone to sit with, and finding them spaces. I got some nice feedback on that from a couple of the parents. I was really impressed by Carrie Anne’s teaching… Not surprisingly, given her experience, she has a great way of explaining things very clearly and enthusiastically. I could tell that her choice of vocabulary was well-considered… just enough information, and a lovely way of asking questions to get the kids thinking. And both she and Alex Bradbury were especially good at trouble-shooting, when it turned out that around a third of the pairs of kids had problems with the sound just not working. Apparently this is really rare in these workshops, but today we were unlucky: it was a shame, as it took some time away from learning… Despite that, it definitely seemed like all the kids were engaged, and got a long way through the excellent worksheets. I reckon I spent at least a couple of minutes with probably a third of the pairs of the kids in the room at one point or another, and the mugging up this morning really paid off. One minor challenge for me was avoiding just telling them the right answer – but instead trying to help them figure things out. A particular highlight was helping one pair work out how to write a loop from 60 to 70 in Sonic Pi… At first, they set the initial value inside the loop, so it was never going to work… A few carefully worded questions, and they worked it out! I was also interested to know the mix of girls and boys attending, so kicked myself for not counting early on – i.e. before the juice-and-biscuit break, after which attendance got a bit more random. But I reckon that there were at least 9 girls out of 32 kids present. Based on today’s experience, I’ll definitely be looking out for future local kids programming workshops to help at. And I’d really encourage anyone who enjoys programming to volunteer at a kids workshop near you. You can find out about future Raspberry Jam events via RaspberryJam. 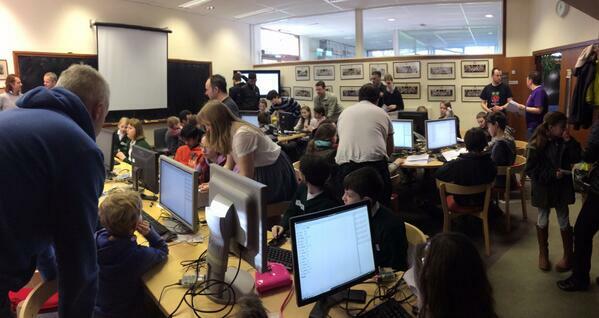 And if you can spare time regularly, there’s Code Club.